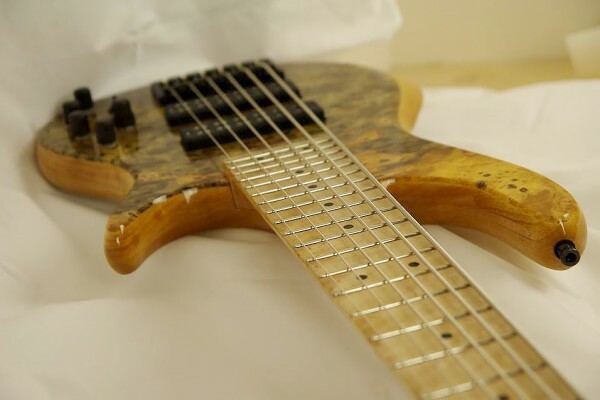 When we posted photos from Summer NAMM in June, there was a huge uproar over pictures that included custom extended range basses by luthier Oscar Prat. We showed an 8-string and a 12-string bass, and the debate on what qualifies as a bass was on! Since then, we’ve caught up with Prat to find out how he got his start as well as how he feels about “more than four” string basses. I built my first bass out of necessity in 1999. I had sold all of my belongings to be able to come to the United States for the first time, including my bass and amplifier. After a few months, and thanks to my experience working with wood, I decided to build my own instrument. Upon finishing, it was obvious how difficult it is to construct something “playable”, without even considering the desired finish. My great hobby of bass building began this simple way and later turned into my passion and work. What was it that made you turn your hobby of building into your profession? As we all know, life takes many turns. I was building instruments self-taught until 2003. My interest was growing and I continued to learn reading books and through trial and error. I then met my good friend and master luthier, Steve Higgins. Steve is from New Jersey but lives in Barcelona. He works mainly in the construction of the classic acoustic guitar. Thanks to him, I evolved into a professional. I studied under him for 4 years and during this time, my “passion” started to occupy more time than my job as an antique dealer. All this time, my style was molding and becoming more personal. Finally, I saw an opportunity and I decided to come live in the United States. It was clear to me what would be my new profession. On your site, you mention you got your start in woodworking from doing restorations in your father’s antique shop. How does that affect your approach to bass building? When I begin a bass, I always consider the characteristics of a fine antique piece of furniture: the quality of construction, the quality of the materials, and beauty. In and of itself, wood is a dignified material and if it is properly chosen and treated, it turns into something precious. This happens with good antique furniture. The wood is part of the design, part of the elegance and beauty of the antique. The wood serves as inspiration and is an integral part of the instrument. I cannot separate “material” and “design”, it’s a combination of both. Around 45. I work as a craftsman, without CNC. Before beginning an instrument, I conduct a long and detailed study of the client and what they want. This process sometimes takes as much time as the actual construction. On average, we could say that each instrument requires 80 total hours of work. This does not allow for the construction of many basses per year. Moreover, working in a totally personalized manner, each bass is essentially different than another. We all have our own preferences and likes, therefore, a Prat Bass will have it’s own differences and character depending on the preferences of the client. I have been lucky to have the best work in the world. Not only for the passion to work in something artistic, but for the difference of each order. Each bass different for me, and I am always learning. My first instrument was much different than the current instruments I make. There has been a evolution resulting from experience and above all else, due to my observation of the real likes and needs of bassists. I have been very lucky to work with great bassists including Garry Goodman, Charlie Moreno, Jauqo III-X… due to high expectations and the attention to detail of these musicians, I have been able to evolve in all areas, personal and professional. A few years from now, the instruments I produce will be different than the instruments I currently make due to this evolution, but each one, the first to the last, will have a common factor: love and passion. Starting a new bass for someone, a new project, always makes me happy. We live in such a technological era, for this reason, almost all of my first contacts are in the form of emails. First the client gives me their wood, sound, and electronic preferences along with price range. Sometimes I meet people that know exactly how they want their bass. Other times, I have people with a basic idea about their future instrument and an open mind for suggestions. Once the type of instrument has been decided, and after many emails, I make a life- size, 2-D drawing to exact the sizes. Because I am very demanding, the process of wood selection is the most important and special for me. Every luthier has a different way of building, but we could say that the base, the center of my instruments, are the fingerboard and the neck, from there we go onto the body and the rest. The change from Spain to the US was radical regarding the construction of instruments. The great difference is that in the USA the demand for ERB (extended range bass) is enormous. I would say that only 10- 15% of my orders are 4 string basses. I did not choose this, but it is possible that I arrived at the right place at the right time. I think the bass had it’s grand evolution with Jaco Pastorius. He was the biggest influence in transforming the roll of this instrument, which was passive, into a soloist instrument. Once this status became the norm, we began to see a new wave of the importance of bass soloists. This has created the need for an extended range of sounds and and frequencies. We see bassists like Gary Goodman, Ives Carbone, Jean Baudin, to name a few, experiment endlessly with sound and music. I am sure they began with a 4 string…. I would tell them to enjoy themselves. This is one of the secrets to building a good bass. The pleasure that comes from the construction will give the instrument a better “spirit”, a better feeling. Also I would recommend that they choose the best possible materials, especially the wood. Finally, my advice would be not to rush!!!! Check out Prat Basses online. Great report but let’s face it a bass has four strings. At times five. What Mr. Prat is doing is interesting but he is not buidling basses with 12 strings–that is a whole different instrument. By the way, recently at a saw an early upright bass in a museum and it has three strings–so from my point of view we evolved to four strings. Well, I do think that 8-12 strings is like a new instrument. I play 5 string and am considering 6 string for the ease of playing a little higher. The point of the bass as a band instrument is to provide a solid foundation for the rest of the group to build on. As a solo instrument bass becomes something different. I would not expect to see an “extended range instrument” except in the hands of an experienced soloist. Oscar is a great luthier and person. He is currently working on my future bass. I can assure he has the ability to know what the customer wants at each moment. It is very pleasant chat with him and see how the work progresses every day through all kinds of photos that he sent from each part of the process. Nice Job Man! Great interview!! i totally agree that 8 strings or more is not a bass. it’s a new instrument I see more related to The archilute and harp.